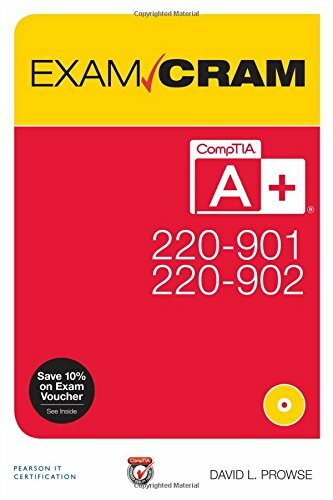 789756315 -This is the perfect study guide to help you pass CompTIA®’s new A+® 220-901 and 220-902 exams. It provides coverage and practice questions for every exam topic, including substantial new coverage of Windows 8/8.1, new PC hardware, tablets, smartphones, OS X, Linux, cloud computing, and professional-level networking and security. Extensive prep tools include quizzes, Exam Alerts, our great last-minute Cram Sheet, two full practice exams in the print book and an additional two exams in the test engine, plus complete real-time practice and feedback through Pearson’s state-of-the-art test engine. You’ll also find ten exclusive Real World Scenario case studies, all linked to simulations or video on the DVD!